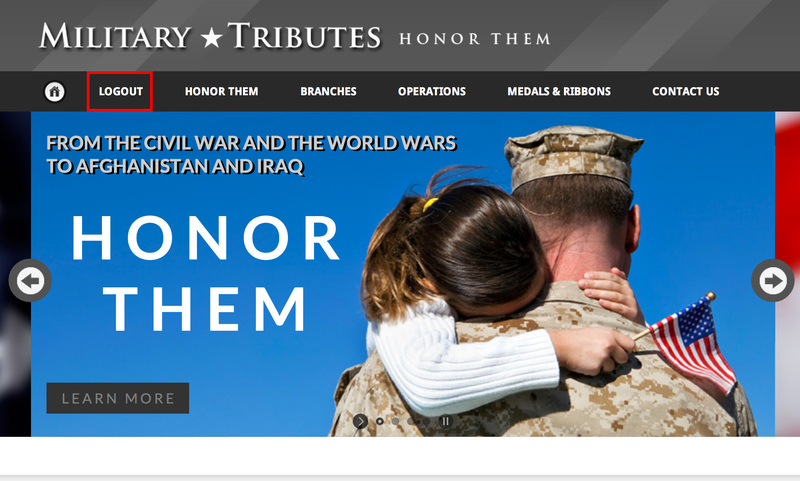 Military Tributes will soon be the largest online collection of personal stories, awards, photos and videos dedicated to American Armed Forces personnel. 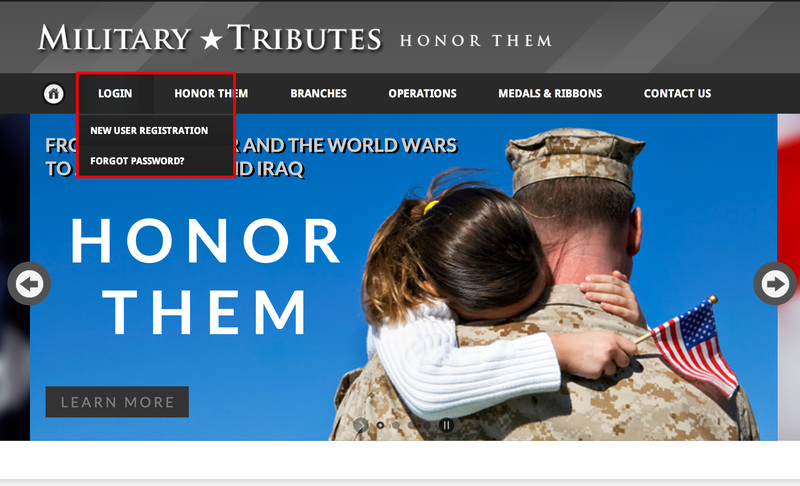 If you have loved ones who have served, currently are serving or soon will be serving in any branch of the United States of America's Armed Forces, Military Tributes allows you to post the ultimate tribute to their military careers online - FOR FREE! What information do I need to create a military tribute? 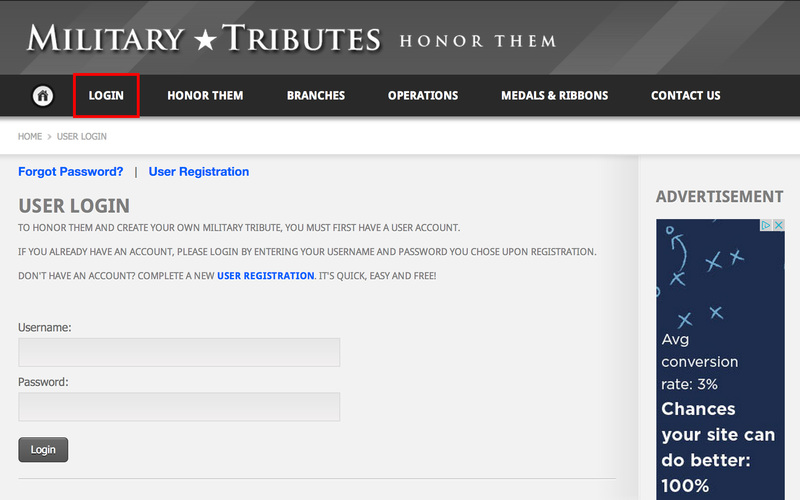 The first step in creating a military tribute is to create a free user account. 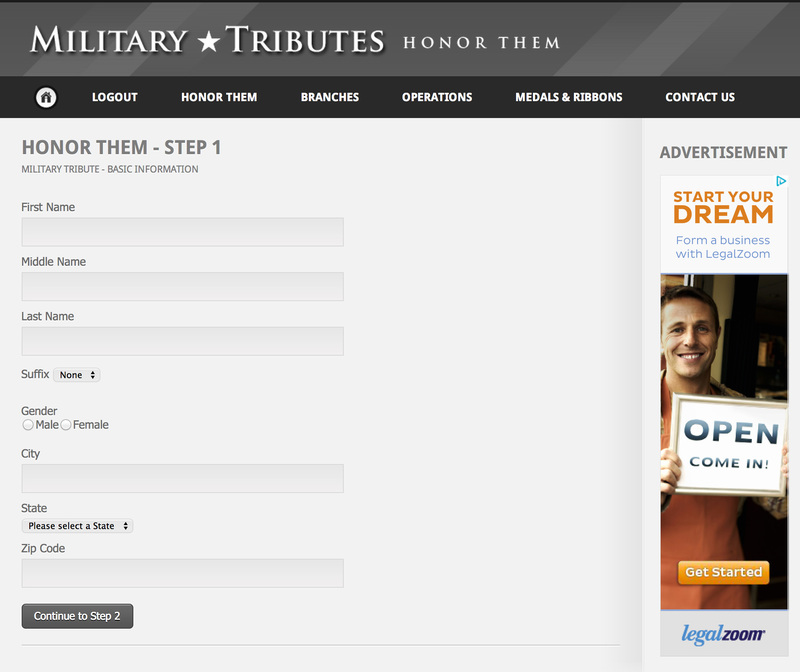 Go to the Military Tributes home page at www.militarytributes.com and select Login from the top navigation menu. 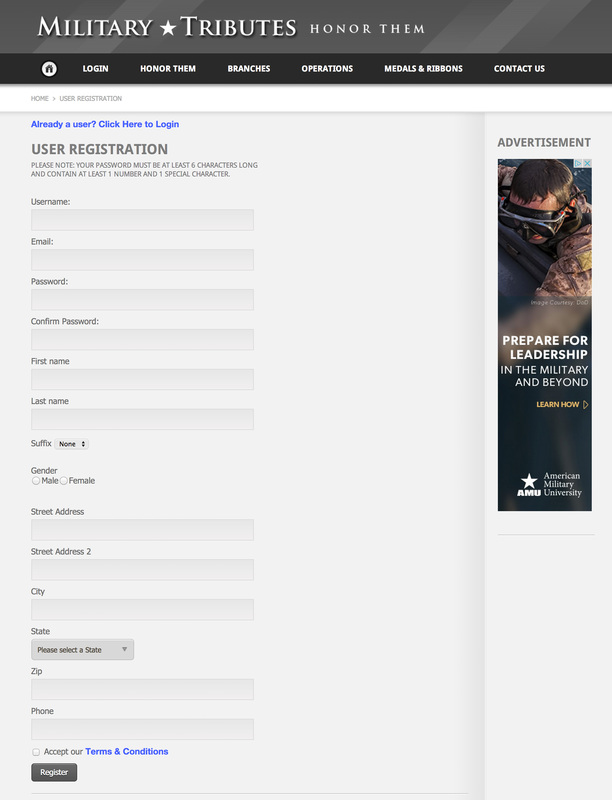 Under Login, select New User Registration. When completing the User Registration form, it is best practice to select a username that is not an email address in the event your username is used in various public sections of the website. The only required fields other than Username are Password, Email Address, First Name and Last Name. You also must check the checkbox for accepting our Terms & Conditions for use of our website. Once you have successfully submitted the User Registration form, you will receive an email to validate that you are a legitimate user with a functioning email address. This email will be sent to the email address you provided in the User Registration form. Please check your Spam folders if you do not receive this email in your regular Inbox. Open the email and click on the validation link. 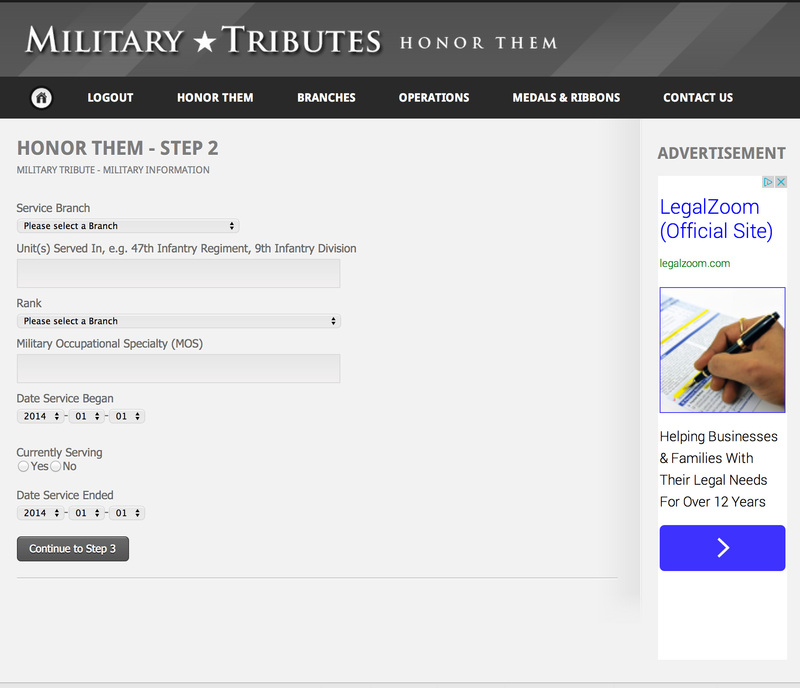 Your account will then be validated, and you can click on the Login option of the top navigation menu and use your Username and Password to login to the Military Tributes website. 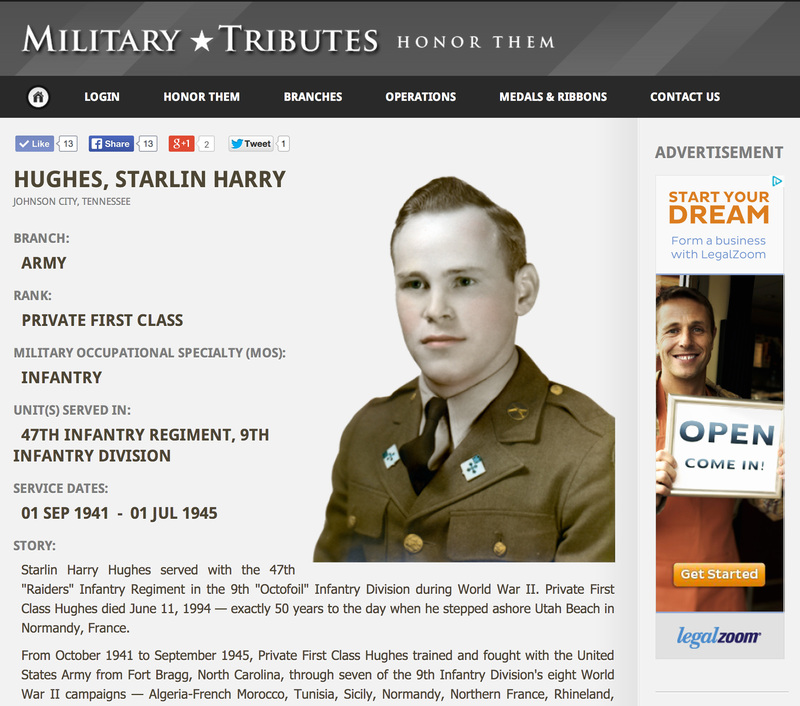 Once you have logged in, you will be redirected to the Military Tributes home page. Now you have a Logout option in the top navigation menu instead of a Login option. 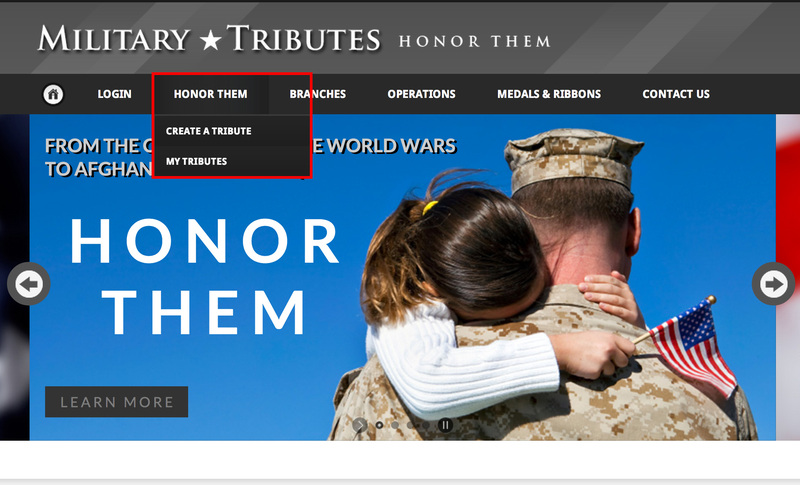 After logging in, go to the Honor Them option in the top navigation menu and select the Create a Tribute option. The first of three small tribute forms will load. Required fields for Step 1 include First Name, Last Name, City, State and Zip Code. Certain fields are required to allow for better sorting in searching tributes across the website. Once you have filled out all required fields, click the Continue to Step 2 button. The second of three small tribute forms will load. Required fields for Step 2 are Service Branch and Rank. Although not required fields, it is very helpful for searching the website to include the Dates of Service, too. Other non-required fields include Unit(s) Served In and Military Occupational Specialty (MOS), Navy Rating or Air Force Specialty Code. Once you have filled out all required fields, click the Continue to Step 3 button. The third of three small tribute forms will load. 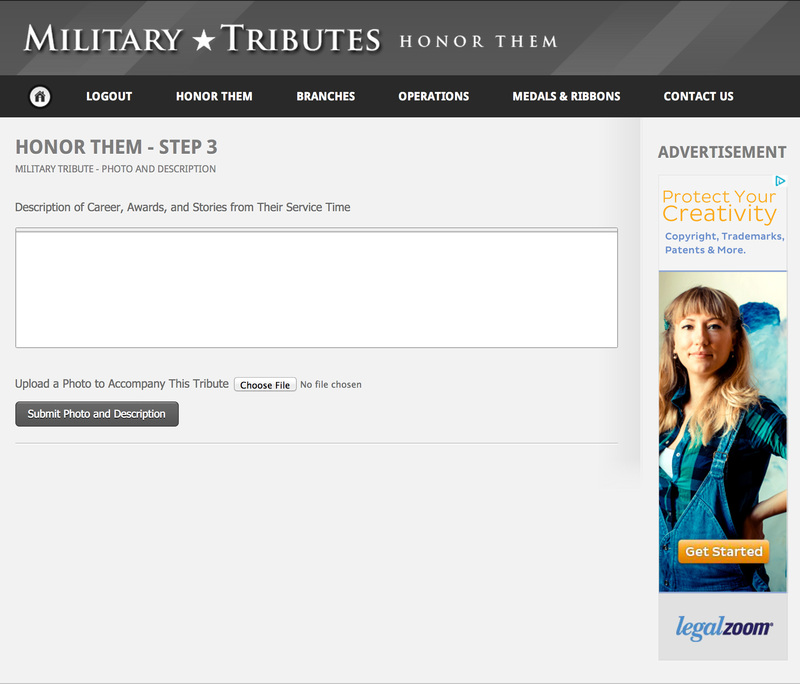 There are no required fields for Step 3, but this is where you can write a lengthy description of the military tribute's career, awards, and stories from their service time and choose one photo to upload from your computer to accompany the tribute listing. Currently, only one photo is allowed to accompany your tribute listing, but there are plans to allow more than one photo in an upcoming release of new changes for the application. Once you click the Submit Photo and Description button, you will be redirected to your tribute's finished listing. On your tribute's official listing page, there are social media options for Facebook, Twitter and Google Plus. You may like, share and comment on your tribute's listing within these social media applications. 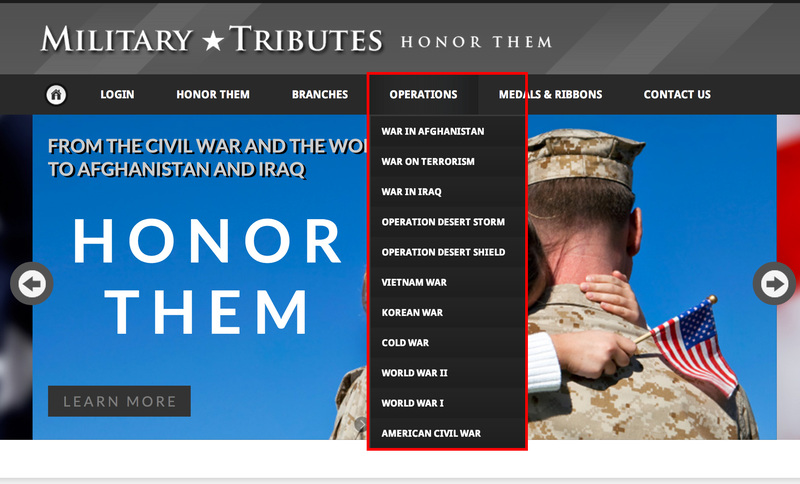 To edit your tribute, go to the Honor Them option in the top navigation menu and select the My Tributes option. Here you will find a list of all tributes you have created with options to view or edit the tributes. When editing a tribute, all data is included in one form. You can make changes to the current information or upload a new photo. The option to delete a tribute will be added in a future release, but if the need arises for a tribute to be deleted, simply contact us via email at honor@teamnormandy.com and we will take care of deleting the tribute for you. 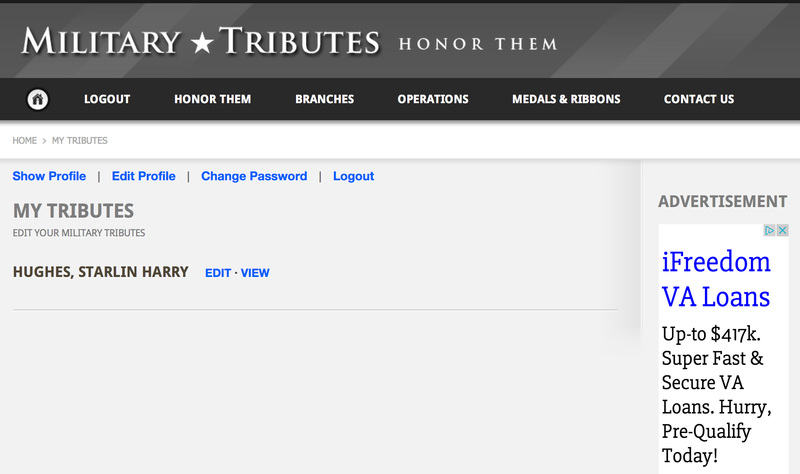 A full-text search by keyword will be added to the Military Tributes website in a future release. 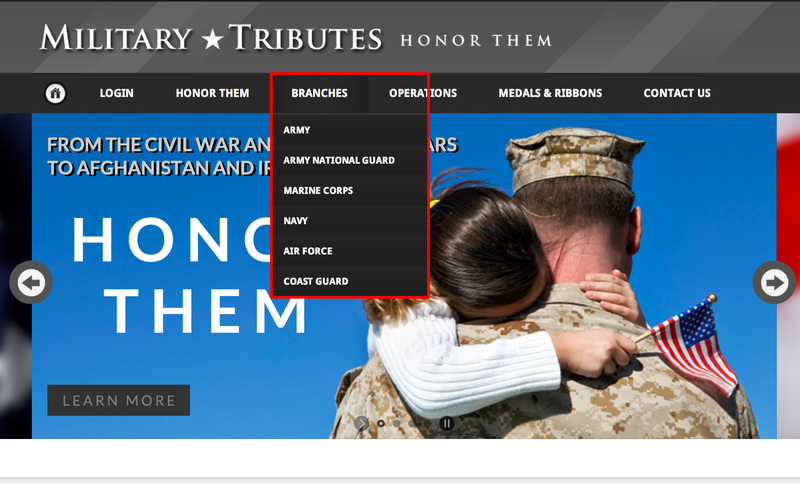 In the meantime, you may search tributes by service branches and military operations. Select Branches from the top navigation menu to see a full list of service branches currently available for searching. Select Army, Army National Guard, Marine Corps, Navy, Air Force or Coast Guard to view all tributes listed in each respective branch. Select Operations from the top navigation menu to see a full list of military operations currently available for searching. Select War in Afghanistan, War on Terrorism, War in Iraq, Operation Desert Storm, Operation Desert Shield, Vietnam War, Korean War, Cold War, World War II, World War I or American Civil War to view all tributes listed in each respective operation. What if I don't have all of the required information to create a military tribute? While account registration and posting tributes are free to all users, Team Normandy does offer website assistance if needed. If you already have all required information needed to post a tribute, Team Normandy will be happy to assist with tribute creation for a flat fee of $29.99. If you need research assistance in locating military paperwork or other items of interest from the government and/or research facilities such as the National Archives in Washington, D.C., Team Normandy charges an hourly research fee of $39.99. If any paperwork needs to be compiled and mailed out to obtain certain pieces of military information, the same hourly fee of $39.99 applies. Thank You for Honoring Our Veterans!